I happened to hit return instead of mouse-click and objects on the desktop began working. I altered the desktop graphic to something bland and it all seems to be working fine. Now I just need to install a game using an ISO file, while I'm waiting for Sheep Saver related downloads to complete so I can have a PPC emulator for a different game. Hopefully, no more help posts are needed. 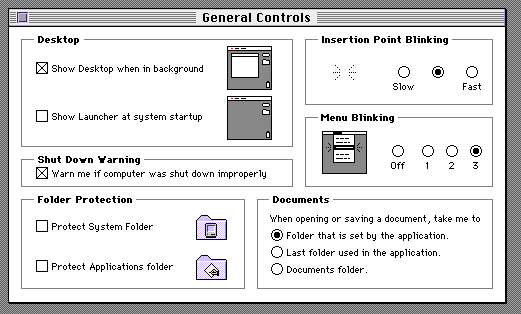 I never used Mac Classic OS until a year back when I needed to look at some early business applications so I know little. However it was enough to examine the apps in question. Today I started up Basilisk for the first time in a year to re-familiarize myself a little; with the intention of loading games. I also made an alias for the desktop. Basilisk worked fine the first time; I do not remember if I stated from the GUI, the executable or the alias, but I was able to open applications. I then shut it down as I would not be installing games for several hours. * there is a large rectangle in the center of the Basilisk screen that is blacked out but with distorted color bars (like old time TV static bars) running across it. * no functions work -- clicking on applications, the OS, the Unix icon, Documents & Trash folders, etc produce a loud beep (single-note per click) and nothing else. I Have tried multiple restarts from app, GUI, and alias to no effect. Seemingly something changed but I don't know what nor see how a change could have occurred. The GUI setting seem the same as before although I do not have a copy of the original settings and am relying on memory that may be faulty. 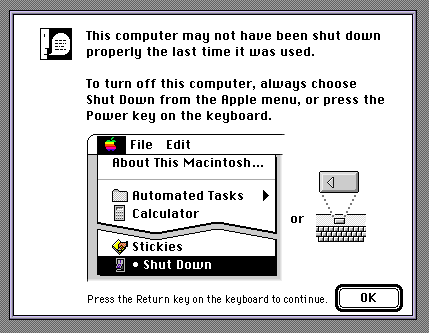 From my experience, vintage Macs used to crash rather frequently. After a crash, the boot drive was checked by the OS to fix probable minor faults on the HDD. With emulators the file system check became less important as one would usually have a backup of the boot disk image somewhere on the host anyway. If the above warning disturbs you much, it may be easily disabled via Control Panels / General Controls. See the little check box in the middle on the left. Don´t hesitate to report mishaps or success here, thats what this forum is about, after all. The document “Virtual-CD-DVD-Utility-10d3.img” could not be opened, because the application “Disk Copy” could not be found. Could not find a translation extension with appropriate translators. * ERROR MESSAGE: the Mount Image operation did not complete (-36). So I forgot DiskCopy 6 again, hm? Sadly DC6 is not included in MacOS 7.5.3, but that should be fairly easy to fix. Expand it in El Cap with The Unarchiver and add the resulting img to the volumes with BasiliskIIGUI.app. 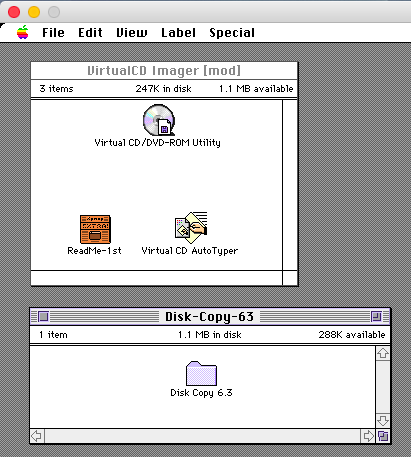 When BasilliskII is up and running, you may move the Disk Copy 6.3 folder to your emulators boot drive. Did you already try mounting your ISO / Toast by means of the BasiliskIIGUI.app? Most CD images can be mounted that way, some installers on the CD may refuse to work nevertheless. Expand it with The Unarchiver: https://the-unarchiver.en.softonic.com/mac. Finally add it to volumes with BasiliskIIGUI.app. Note that the BasiliskIIGUI.app stopped working correctly due to new Apple security schemes. It is still possible to edit and save the BasiliskII config file. Running BasiliskII from the BasiliskIIGUI.app fails with Sierra or higher - not sure about El Cap, as I´m not using it right now. I am obviously not very familiar with Basilisk. Adding Disk Copy & Virtual CD DVD... and both games -- the ISO and TOAST files as bootable through the GUI works perfectly. BTW My Mac is actually running Mac OS High Sierra; El Capitan is on a Parallels VM. I needed to install this so I could continue to run older OSX software I use professionally and when I saw Basilisk also not working on M-OS HS I moved it there. There is an issue with macOS 10.12 Sierra (in fact with an additional new security feature in Sierra) that prevents a newly installed SheepShaver to run. remove the old program in the SheepShaver folder and move the new copy from the desktop to the SheepShaver folder. OSX Server 10.5 or 10.6 in VMWare may be worth a thought too, if you also want to run PPC software.